Hello, hello! How are you? I'm here today to share with you all of the delicious foods that I got to eat on Friday in New York City. I few weeks ago I planned a day trip to NYC to hang out with my friend. I loooove the City so so much. I'm sure that many of you who have lived there or spent a lot of time there understand! If you're not one of those people, then what are you waiting for? Get yourself there asap! We had the best time doing yoga and eating tons of delicious vegan food. Is there a better way to spend a day?! I don't think so! I woke up at 4 a.m. to drive 5 hours across Pennsylvania to get to NYC. 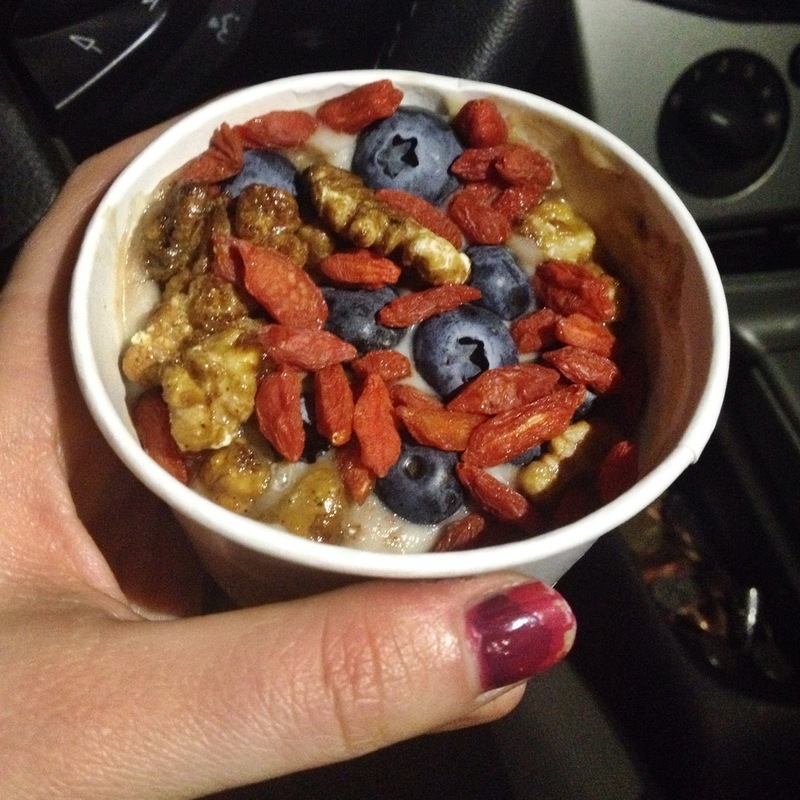 I had overnight oats around 5 a.m. so by the time that I got to the city I was pretty hungry! I ran to Juice Press as soon as I got there to grab a drink. I have been loving latte inspired drinks lately for some reason! Which is why I went with the Black Label Latte. I drank it in about 3 seconds because it was so good. Let's be honest though, you can't go wrong with anything at Juice Press! If you've been following me for a while, it's no secret that I am actually in love with Pure Food and Wine. I am so so grateful that I have found it and have been able to eat there pretty much every time I'm in the city. (Even two or three times on some trips, whoops!) It was a beautiful day on Friday so we were able to eat in the garden which is so lovely. 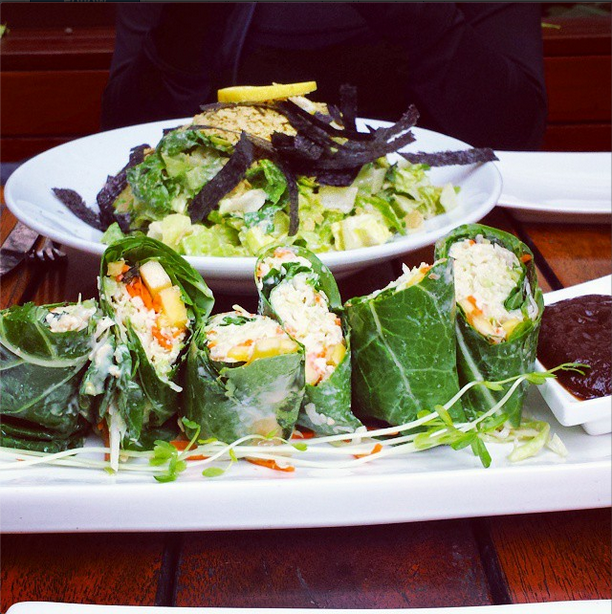 We ordered the Spicy Thai Lettuce Wraps and a Caesar Salad to start. We shared both plates and everything was great, as usual. I love going out to eat with people who are willing to share their foods. You get more variety that way and it's fun! After we got in all of our greens it was time to get serious. Dessert is obviously the most important part of the meal. 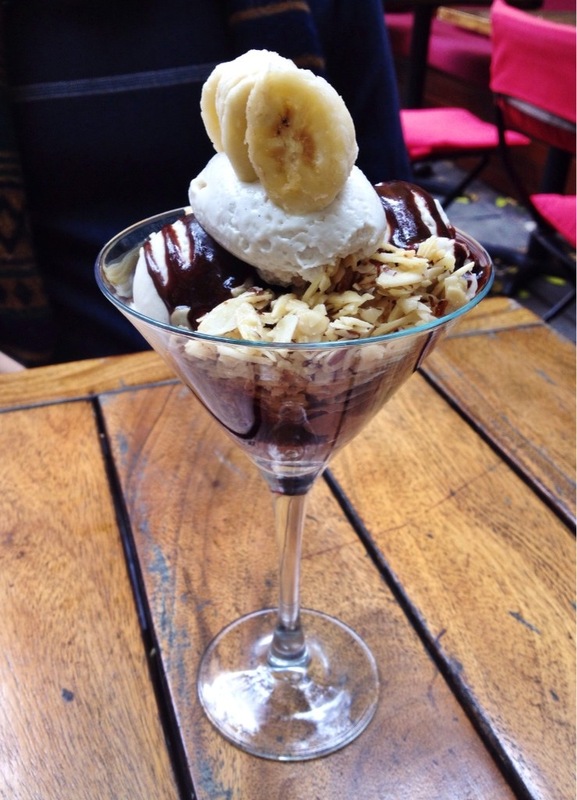 ;) We debated on what to get and finally decided on the Classic Sundae. Every single time I get a sundae from Pure Food I am blown away by it. It is incredible what they're able to create and so inspiring. And delicious!! P.S. I didn't know this was even possible, but I think that I like the Classic Sundae more than the Mint Sundae. Tough choice though! After we went to Pure Food we went straight to Babycakes for dessert round two (which happened to be my dinner too, whoops!). It is so awesome to be able to have so many gluten free and vegan options all around you in NYC. I don't have that where I live (I drive 60+ minutes to buy dates) and I try to take full advantage of it when possible. It was so tough deciding between every single thing in the bakery! Usually there's one or two options for me and I just go with them. But everything at Babycakes is gluten free, soy free, and vegan. So awesome! We went with a pumpkin eclair, pumpkin cranberry donut, and a cinnamon roll. Amazing!! The pumpkin eclair was out of this world delicious. The cinnamon roll was great! I love cinnamon rolls and can't remember the last time I had one. The pumpkin cranberry donut was good too! But I liked the other two the best. I don't eat nearly enough greens when I'm home but in public I can eat them like crazy. So when we stopped by Organic Avenue I went straight for the green juice. I figured that I should balance out the large consumption of sweets with a green juice! I bought this during the day at Hu Kitchen. I wasn't sure when I was going to eat it because I was so dang full from all of the other amazing things I ate that day. But during my drive home I was so grateful for this! This is the taro pudding with blueberries, maple walnuts, and goji berries. Ahh my gosh. I've never had taro before this and I am obsessed. It's so good! Every time I take a trip to NYC I have to bring home some stuff! I bought home a Taco Salad, Caesar Salad, and Snickers Cupcake all from One Lucky Duck. Yum!! That's it for today friends! I had an amazing day eating lots of awesome foods and wanted to share! I love when people share their foods and favorite restaurants with me, so definitely do that if you want! Then we can be excited about the yummy foods together. Mmm!